On Tuesday of last week an impressive ceremony was held at the old Hawken Cemetery east of Tuscumbia in which a marble tablet in memory of Charles Smith, a soldier of the Revolutionary War was dedicated by the Jane Randolph Chapter of Daughters of the American Revolution, of Jefferson City. Ten women who are officers and members of that chapter of the D.A.R. and a sprinkling of Tuscumbia folk attended the ceremony and paid their respects to another one of those valiant ones who risked their lives for American liberty more than a century and a half ago. Just as now history is repeating itself. 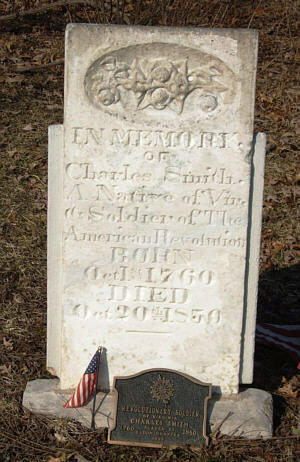 Charles Smith, if he enlisted when the American Revolution first began, was a fifteen year old lad, but he lived to be ninety years old and to see the American Colonies vindicated in their fight for freedom. He is listed in the War Department as "Trumpeteer, 2nd Virginia Line, Revolutionary War". From other records, chiefly family bibles and now almost priceless papers, he was a native born Virginian and came to Missouri in his old age with a son, Champ J. Smith, and his wife Martha Sellars Smith, and there are listed a goodly line of descendants from these progenitors. Attending the D.A.R. dedications ceremonies was one lineal descendant, Mrs. Homer Lee Wright, who is a great-great-granddaughter of Charles Smith. Another Lineal descendant, William H. Hauenstein, who lives west of Tuscumbia is a great-great-grandson. Members and officers of the Jane Randolph chapter who arranged and carried out the dedication ceremonies were Mrs. Walter Steininger, Regent; Mrs Oscar Williams, Chaplain; Mrs. Carl Schultz, vice-regent; Mrs. J. L. Edwards, secretary; Mrs. John W. Hobbs, Chm. historical research; Mrs. Sam Haley, Mrs. Henry W. Ellis, Mrs. Richard D. Fowler, Miss Virginia Mayo, Mrs. W. A. Comstock. When the present scarcity of important metals, due to war needs, is over with, the D.A.R. organization will replace these temporary stone markers with bronze tablets as has heretofore been done throughout the country, this being one of the important patriotic activities of the various charges.